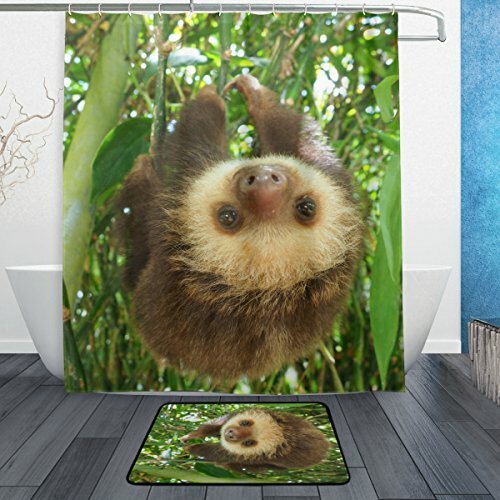 ALAZA Cute Animal Sloth Baby Sloth on Tree Branches Shower Curtain and Rug Mat Set will give you a good mood when you're taking a bath. Function: the bathroom set can decor your home when holiday, such as, valentine's day/halloween/christmas ect. It's also a suitable housewarming gift. Size: shower curtain 60"W by 72"L(152.4 x 182.88 cm), it fits the standard bathtub and shower area. Bath mat rug 23.6" x 15.7"(59.94 x 39.88 cm). Including: one bath mat, shower curtain and 12 shower curtain rings. Shower Curtain 60"W by 72"L: Waterproof/mildew resistant polyester fabric shower curtain with 12 plastic hooks. Bath Mat Rug 23.6"L x 15.7"W: made of high density memory sponges and non-woven fabric material which are wear-resistant, non slip and soft touch. Function: the unique bathroom set can decor your room at festival. It's also a ideal housewarming gift. Wash: hand washable or machine washable, do not bleach or drying.